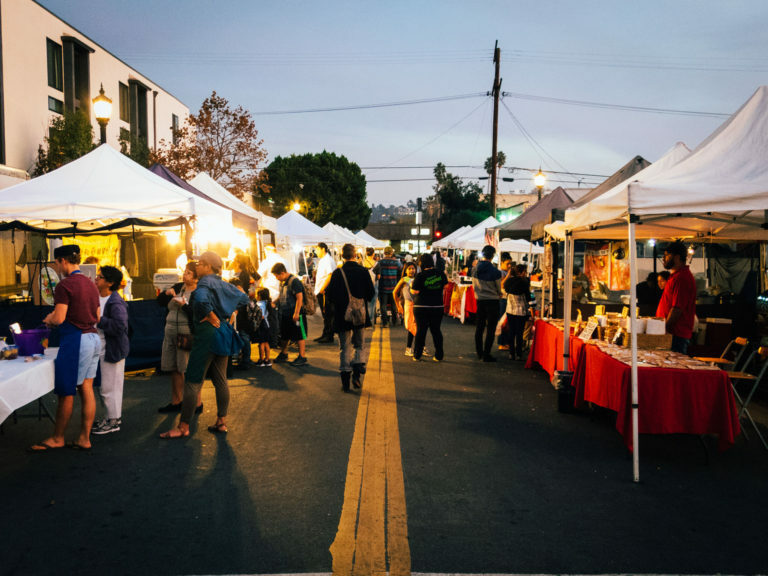 Located at the intersection of Avenue 58 and Marmion Way, the farmers market is just steps away from the Highland Park Metro Gold Line station, and serves the entire Northeast LA area. We recommend taking the metro, but if you drive, there is plenty of street parking nearby. With only 10 participating farmers, it’s considerably smaller than other farmers markets in the LA area. Rest assured, this one is legit. It’s certified, which means that all the produce is coming directly from local farms. For real, the government actually checks to ensure that the produce sold by a farmer is grown by that farmer. This farmers market, though small, has more than just food. Walk down Marmion Way and check out all the eclectic vendors selling arts and crafts, jewelry, vintage clothing, accessories, games, plants, antiques, and more. If you can find it at a flea market, you can probably find it here. On occasion, you may even find someone playing live music. But let’s be honest. When you go to a farmers market, you’re there for the food. And you’ll find that on Avenue 58. Of course, like with any certified farmers market, there are stalls with lots of bright, colorful, fresh produce. Keep walking and you’ll find delicious options to munch on. Don’t be shy. Sample as much as you can! There is something for everyone here – even vegans. Don’t skip the roasted peanuts. They are surprisingly good. In the mood for dessert? The panna cotta from the coconut macaroon stand is a sweet treat that melts in your mouth. If you need something more substantial, get some tacos or tamales. Or try some fresh sushi at one of the newer vendors. Wash it down with juice from the Todo Verde juice stall. Get the “LA Water,” but don’t let the name fool you – it’s sweet and refreshing. The Highland Park Old LA Certified Farmers Market is open every Tuesday from 3 p.m. to 8 P.M. all year round.